License: US$59.99 (SkySafari Plus US$14.99, SkySafari 3 US$2.99) Compatible with iPhone, iPod touch, and iPad. Requires IOS 4.0 or later. As an amateur astronomer and a volunteer public observatory telescope operator, I regularly use astronomy related programs and applications. I have reviewed several of the iOS applications here on MyMac.com. 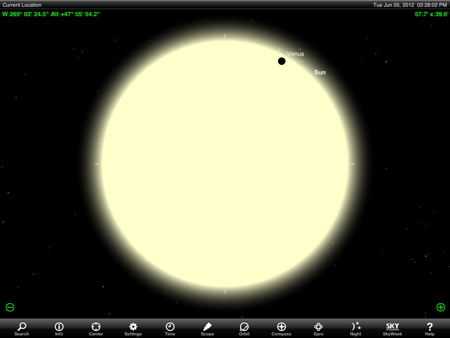 Southern Stars makes SkySafari for Mac OS X, and SkySafari 3 for iOS. It is available in three different performance and cost options: the basic, the Plus, and the Pro version. About a year ago I purchased the SkySafari Plus for my iMac through the Apple App Store. The performance and capabilities of this program on my iMac are excellent. 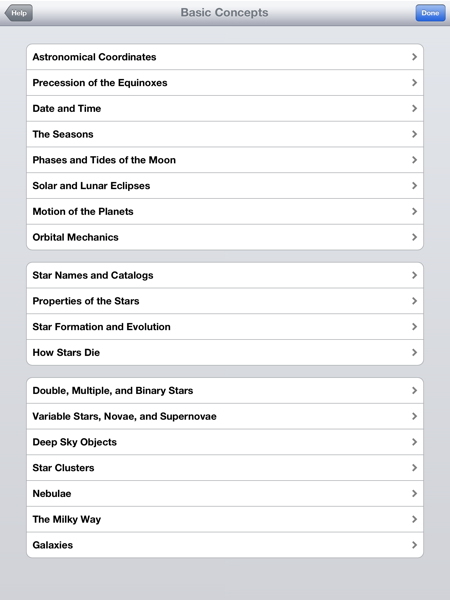 I have now added the SkySafari 3 Pro iOS version to my iPod touch and iPad. I find that this iOS application is as powerful and capable as the Mac OS X version. The basic differences between the Plus and Pro versions for both iOS and Mac OS X are: a larger data base, a high resolution Moon map based on NASA’s Lunar Reconnaissance Orbiter data, and sub-arc second precision from any location on Earth, at any time, up to one million years in the past or the future. For those that would like to use SkySafari 3 to control their personal telescope, both the Plus and Pro versions provide this capability. The application also takes advantage of using the built in gyro on our portable devices allowing you to position your sky display relative to where you are looking in the night sky. Let me use a few examples to help illustrate some of the many capabilities of this powerful application. 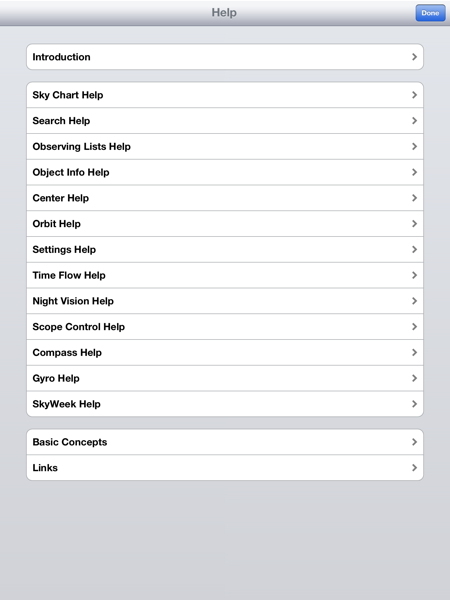 When you open SkySafari 3 Pro on the iPad, you are presented with a display, based on a default location and time. After setting up your own location, selecting a horizon background, and then making sure your time zone and daylight savings time settings are correct, you are presented with the display similar to the one shown in figure 1. The buttons across the bottom of the display provide access to a multitude of functions and settings. You can position the sky in any direction by touching and dragging. Tapping items on the display allows you to select an object in the heavens. You can then zoom in or out on the object by pinching with two fingers or simply touching the minus or plus buttons located at the bottom left and right. You can use the finger jesters to keep the object centered as you zoom into it, or simply select the Center button in the control panel at the bottom. Tapping in the upper left corner of the display pops up another control panel that allows you to quickly position through North, South, East and West, change the magnitude settings for the stars and deep space objects, and change the coordinate settings. Tapping the top right corner of the display pops up another control panel that allows you to change the field of view, show field of view indicator rings, and flip the view to match the view as seen through one’s telescope. Even though it may seem somewhat intuitive as to how one interacts and can use this program, there is a learning curve to climb. Simply touching the Help button provides the display shown in Figure 2. I suggest spending the time to read through each of the available selections to familiarize yourself with all of the features and settings that are available. For an example, selecting Basic Concepts in Help brings up the sublist shown in figure 3. 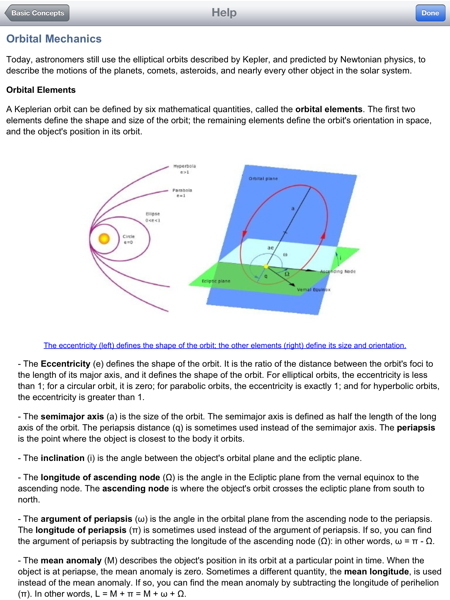 Let’s say you want to refresh your basic understanding of orbital mechanics. If you select that that option, SkySafari brings up a short tutorial as presented in figure 4. This compact nesting of available options provides a wealth of features that really enhance the power of this application. To illustrate this further, let me take you through some additional examples. Let’s start by checking out the planet Saturn. 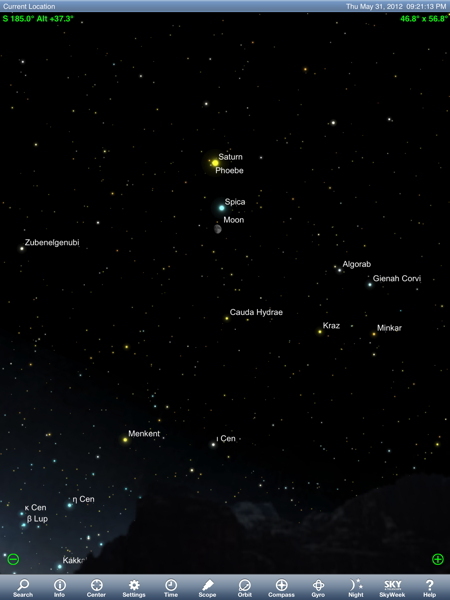 You can look for the planet by touching and dragging to move the night sky around until you locate Saturn or simply select the Search button at the bottom of the control panel, then select Planets, and then select Saturn. Using the latter approach, SkySafari brings up the Object Information display illustrated in figure 5. 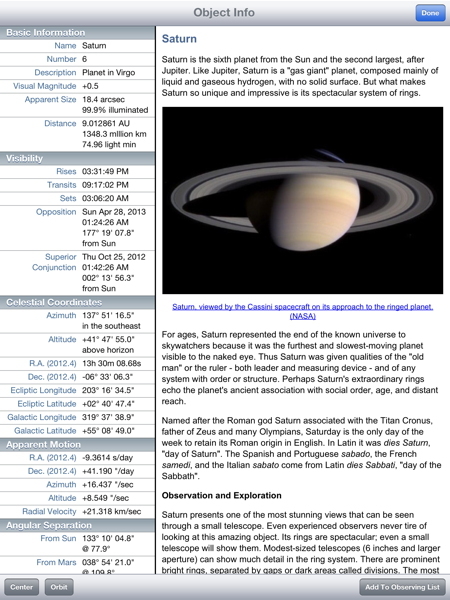 You can scroll through the information about Saturn and then select Center in the lower left corner of the display and you will be returned to the evening sky with Saturn centered in your display. 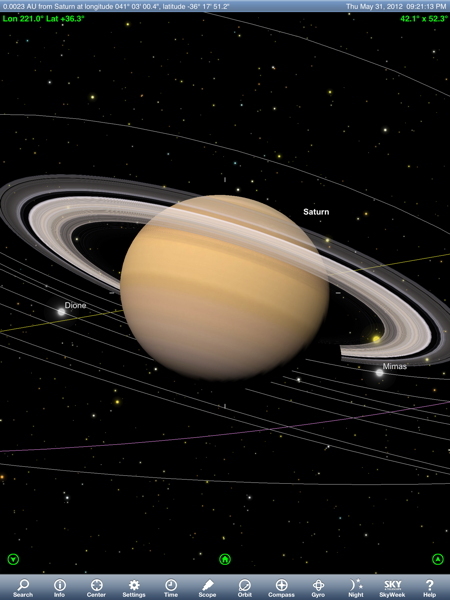 However, if you select Orbit instead of Center, you will be viewing Saturn from an orbit nearby the planet. Again, you can use jesters to view Saturn from any angle and from varying distances. You can also zoom in and out by using the move in and move back arrows located on the right and left near the bottom of the display shown in Figure 6. Pressing the Home button in the bottom center of the display will return you to the view of Saturn, as seen from Earth, centered in the night sky. For another example, allow me to illustrate the partial solar eclipse of May 20, 2012 as observed from Tucson Arizona. First I select Search, then Planets, then Sun. Next I select Time and adjust the date and time to May 20, 2012 at 6:30PM. I select Center to center the Sun in the display of the sky and then zoom in. I use the Settings button to go to the Horizon & Sky setting and turn off Show Daylight. 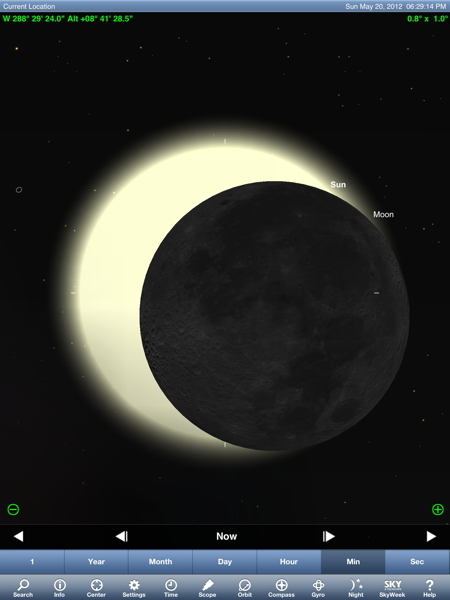 Returning to the main display I then adjust the time slightly to show the partial eclipse as shown in figure 7. On May 20th, here in Tucson, many of us amateur astronomers viewed and showed the partial eclipse to the public. This simulation by SkySafari 3 Pro really does a very good job of illustrating what we observed. Last, using basically the same steps I used to recreate the partial solar eclipse, I will repeat the same to simulate the Transit of Venus that occurred on June 5, 2012. Figure 8 and shows how the simulation captured Venus shortly after it began crossing in front of the Sun as seen from Tucson. 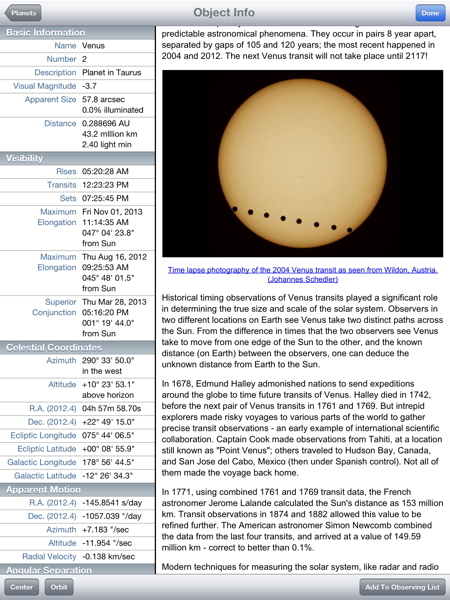 Figure 9 illustrates how, by simply tapping on Venus to select it, and then touching the Info button brings up additional details about the planet, including Transits of Venus. These examples illustrate only a small portion of the capabilities of this application. One can spend hours exploring the many capabilities it offers and appreciate the power it provides to the user. The price may be a little on the high side. However, in my opinion, the outstanding capabilities provided are worth the cost. Therefore, I am awarding SkySafari 3 Pro a MyMac.com 9 out of 10.